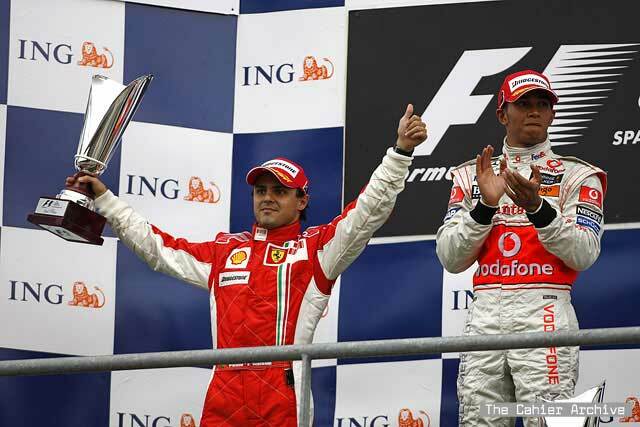 Lewis Hamilton scored a wonderful win over Ferrari at Spa on Sunday, snatching victory from Kimi Raikkonen in the dying moments of the race, as rain began to fall on the Belgian circuit. It was a terrific race, with plenty of spectacular action. There was no shortage of scrambling in the final few minutes with a number of drivers stretching the rules as they did everything they could to make it to the flag. But when it came to handing out punishments, the stewards concentrated on Hamilton. In Valencia a fortnight ago Felipe Massa was investigated for "unsafe release" from his Ferrari pit. His penalty normally would have been a 10s stop and go penalty, which would have denied him victory. Instead Felipe was fined. At Spa a McLaren was in the firing line and the decision was very different. A 25secs penalty dropped Hamilton from first to third. "I would be surprised if there was a penalty," Hamilton said before the stewards' decision. "This is motor racing and if there is a penalty something is wrong. It was fair and square, it would be absolutely wrong if that happens, but we know what they're like." Everyone in Formula 1 knew exactly what Hamilton meant - and millions of spectators across the world as well. Whether the FIA likes it or not there is a widely-held belief that Ferrari is always favoured by the decision-makers, particularly if McLaren is involved. The FIA argues that this is not the case, but who believes it these days? There have been too many decisions like this. The actual decision is really irrelevant. Hopefully Hamilton will direct his frustrations and win the World Championship without needing the points he lost at Spa. The key question is whether the FIA can find a way to restore some faith in the sport. People are tired of such rubbish, particularly as the credibility of the FIA is at an all-time low after the Mosley Scandal. We're not saying that there is a giant conspiracy against McLaren, but all too often it looks that way. It happens time and time again. And when the boot is on the other foot the decisions seem to be different. In F1 circles it is called "the red car rule". People just do not believe it any longer. And that is scary because if they stop believing in the sport, then we are lost. It is really not clear what Hamilton was supposed to do after the incident. He ran across the chicane and then carefully backed off and allowed Raikkonen to repass him. At the next corner Hamilton was able to scramble ahead and, after another gripping skirmish at Pouhon that lap, he went on to win as Raikkonen blew his chances of victory by first spinning and then crashing out of the race in the damp conditions. Hamilton made no such mistakes and took what was an impressive victory. In those wild laps Raikkonen did a number of things that might also have been punished. He appeared to use the high-friction run-off areas at Pouhon to gain advantage and close right up to Hamilton. He then clearly overtook Hamilton at a point where there was a waved yellow flag. He did not mean to do it, he was avoiding a collision with Nico Rosberg, who was rejoining the race after a spin, but it is also clear that Hamilton was doing everything he could do to avoid gaining an advantage from what he had done. "We look at all our data and also made it available to the FIA stewards," McLaren said in a statement. "It showed that having lifted Lewis was 6kmh slower than Kimi as they crossed the start finish line. Having passed the lead back to Kimi, Lewis repositioned his car, moving across and behind Kimi to the right-hand line and then outbraked him into the hairpin. Based on this data, we have no option other than to register our intention to appeal. We are a racing team and will now focus on Monza, with a view to extending our lead in the Drivers' World Championship." It is so sad that the day had to end as it did for it had been a super race. Hamilton led from the start but then had a quick spin at the start of the second lap that allowed Raikkonen to go ahead. Kimi had made no friends by forcing his way past team-mate Felipe Massa on the first lap, deliberately running wide on to the run-off area at La Source to gain an advantage on the run own the hill to Eau Rouge. Massa said he had been too cautious. "It was pretty close," Massa said. "Kimi was so quick he was going to pass me easy, yet he started to close the line and we nearly touched wheel to wheel. I thought that was strange." That looked like a falling out. Kimi has seemed asleep for much of this season but at Spa he seemed suddenly awake and ruthless. Or desperate. In any case he was ahead and there he stayed as Hamilton tried to hold on. Hamilton was the first to pit for fuel, on lap 11. Raikkonen was in a lap later and by the time the stops were completed Kimi had increased his advantage as Lewis had been caught in traffic. The plan had been to do a short stint to try to make up time and take the lead at the second stops, but it did not work. It looked as though all was lost, but in the closing laps Lewis found he could close on Raikkonen. With eight laps left Kimi was two seconds ahead and seemed to be comfortable but then spots of rain appeared at the back of the track and suddenly the story changed. "I was just pushing, pushing, pushing, trying to close the gap," said Hamilton. "I would pull back a tenth at a time, and then he'd pull away. I was hoping that he'd catch traffic, and sometimes he got it on the straight and got a tow, and sometimes I'd get it in a corner. It was mix and match. Going through Eau Rouge I could see clouds and I was praying, 'Please, rain, rain, rain!' I knew how to deal with it. Then I saw Kimi begin to back off." The battle got wilder as the conditions grew worse and as they went into the chicane at the end of lap 42 they were side-by-side. "I was in a good position to dive inside him and he covered his spot, which was fair," Hamilton said. "He braked early, so I went round outside and left him enough room. He accelerated, or picked up more pace in the corner, and drove me as wide as he possibly could. I had no room left. I thought, 'If I stay where I am I can try to go over the green astroturf bit and hit him, or I go left.' The latter was the option I had to do, so I did it." Hamilton was thus ahead. He knew that he had to give the place back and he did. The team told him as well. There was no attempt to avoid the rules. "I was still accelerating, but not at full throttle," he said. "He was in my blind spot so I waited until I saw him come by and then got on it and back into his slipstream." They headed into La Source with Kimi jinking about trying to keep Lewis behind but Hamilton nailed him and went down the inside. At the apex of the corner Kimi nudged him up the back, obviously frustrated at having blown it after a good afternoon of racing. Out on the track conditions were worse and at Pouhon Raikkonen went way wide on to the high friction tarmac that is designed to slow the cars. It gave him extra grip and he came back at Lewis as they went into the next right hander. The problem was that Nico Rosberg had spun and was getting back on the track as the two leaders arrived. Yellow flags were being waved. Hamilton had to go left on to the grass to avoid the Williams. Kimi nearly ran into the back of it, but managed to scrambled through. Raikkonen had overtaken both cars under a yellow flag. He did not mean to. It just happened. Did anyone question that? It was all irrelevant as almost immediately Raikkonen spun and Lewis was ahead again. "It was so much fun," said Hamilton. "My heart was racing more than it ever has before!" Raikkonen tried to give chase but then spun again and this time piled the Ferrari into the wall. His comeback was over. The Italian media started to sharpen their knives again. He had blown it. Hamilton still had to get his car home but with Massa looking for points there was no challenge and Lewis backed right off. Behind him there was all kinds of excitement as the chasers scrambled for points. Heidfeld, Glock, Rosberg, Nakajima, Coulthard and Fisichella all dived into the pits for intermediate tyres. Alonso went too. As Spa is a long track the ploy worked and Heidfeld pulled off an amazing lap as he went past Vettel, Kubica and finally Bourdais to grab third place. Bourdais lost his momentum and was passed by Vettel and Kubica. Alonso's gamble also paid off, hustling the car around to finish fourth. Heidfeld has had a tough time of late and this was a reward for him. "I was convinced it would be heavier on the next lap and decided to change to wet weather tyres. The team asked me if I meant what I said. When I left the pit lane after the stop I asked on the radio how many laps to go, and my engineer said this one and another one. It was a Hero or Zero decision." Although Bourdais lost out it was still a good day for his team with both he and Vettel bringing home points. "On the last lap it was a lottery with the car getting away from you with every turn of the wheel," Bourdais said. "It's a horrible situation, as everything had been under control up until then. But I am not in a situation where I can risk everything and at the end of the race I didn't even know where I finished. It was so close to being a great result I felt I could almost touch it and so it was a very frustrating way to finish." Glock's gamble also seemed to pay off but later he was docked 25s for ignoring waved yellows, so he dropped from eighth to ninth behind Mark Webber, who thus took a point for Red Bull. Others had suffered earlier. Jarno Trulli made an astonishing start, only to get hit heavily from behind by Bourdais at La Source. The Toyota handled terribly for the rest of the day and Jarno dropped away. Bourdais was lucky. Heikki Kovalainen made an awful start and bumped into Nick Heidfeld. Later Trulli spun in the chicane at the end of the lap, while a recovering Kovalainen pushed Mark Webber into a spin there as they battled. Later he was judged at fault and got a drive-through penalty. It was an entertaining race which lit up like a firework at the end. Sadly the stewards threw a bucket of cold water over the whole event. We can only hope that the FIA Court of Appeal will be a little more reasonable. But few believe that will happen. * Hamilton penalised 25 seconds for cutting the chicane. ** Glock penalised 25 seconds for ignoring waving yellow flags.